​The red door of Saint David of Wales Episcopal Church is usually open, whenever the weather allows. Our community within is a true reflection of the neighborhood where we live: a warm and inclusive family of seekers and followers of Christ who love God and each other, seek the mystery through reverent liturgy, crave intellectual and spiritual engagement, and appreciate really good coffee. ​Our worship reflects the theology of The Episcopal Church. We worship with our bodies and all of our senses - stand and sing, sit and listen, turn to your neighbor, smell the coffee, share your treasure, enjoy a holy meal, pray and sing some more. We take ordinary things like bread and wine, and ordinary people like you and me, and our children, grandchildren, and grandparents, and make them holy through prayer, song, and story. We draw from ancient stories and from everyday encounters with the holy and the unholy. Here at St. David’s we are also blessed with a huge extended family in the many people who use our building each week. We like to think this extended family is as much a part of St. David’s as the people who were baptized here 50 years ago or married here 40 years ago. 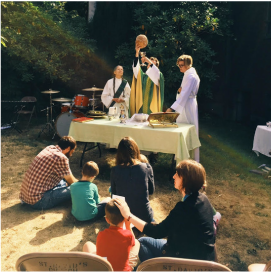 Our extended family reflects the values of our Anglican tradition–creativity, diverse spiritual practice, community life, justice, creation care–as well as the values and ethos of our inner Southeast Portland neighborhood. Whoever you are, wherever you may be on your journey, there is a place for you here and all are welcome. Truly. Come join the table, the conversation, the community. Come join our family! "A warm and welcoming community. A good place to learn more about God, hear encouraging and uplifting messages, and enjoy the very best coffee hour in Portland!" Why wait for Sunday? You can dive into our rich heritage of prayer by taking a look at the Book of Common Prayer online, read the Nicene Creed, or sneak a peek at upcoming passages from the Bible we'll read in church from the lectionary. 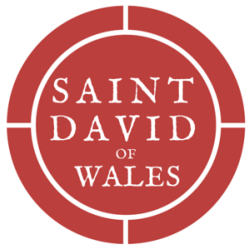 Saint David of Wales is an Episcopal church and grateful member of Episcopal Diocese of Oregon.